The cold weather is set to continue over the weekend with yellow warnings in place for snow and ice and some snow accumulations expected on high ground in East Lothian overnight. Saturday will become dry but cold, with a band of sleet and light snow expected on Sunday. This entry was posted in Severe Weather Update on February 1, 2019 by Admin. Be prepared! Garvald and Morham can get cut off in the snow in winter and/or have power cuts. Please let Penny Short (the Community Emergency Co-ordinator) know if you might need extra help in the event of adverse weather or power cuts. This includes if you are vulnerable or have specific health needs, a chronic illness, a requirement for carers or use electrical medical equipment. Please contact Penny using the form below. Pack a small emergency kit and keep it in a safe place at home, in a waterproof bag. Your kit should include a torch and spare batteries (or a wind up torch), a battery-operated radio and spare batteries (or a wind up radio), mobile phone charger, essential medication, some toiletries and a first aid kit, 3 days’ supply of bottled water and ready-to-eat food (that won’t go off), copies of important documents like insurance policies and birth certificates (in case you need to locate these quickly or prove your identity), pencil, paper, a penknife, matches and a whistle. Think about what else you and your family might need, should an emergency occur over an extended period. For example, ensure you have enough food supplies (keep some tinned food and long-life or powdered milk), formula/baby food, pet supplies. Consider purchasing alternative heating methods, a camping stove and an analogue phone (modern digital cordless phones will not work in a power cut). Keep as warm as possible. Wear layers of clothing and keep at least one room in the house heated. Please try your best to check on vulnerable neighbours and help them to prepare. Pack an emergency kit in your car. The emergency kit could include a first aid kit, battery jump leads, a torch and spare batteries, a map for unplanned diversions, a blanket, a reflective warning sign. In cold weather, you should also take a shovel for snow, warm clothes and boots, some food, and a warm drink in a flask. This information has also been published on the Community Council web pages so you can access it when necessary. This entry was posted in Announcements, Community Council, Severe Weather Update on January 18, 2019 by Admin. Yellow warning for for snow and ice from 12:00 noon on Sat 15 December To 10:00am on Sun 16 December. Heavy snow and blizzards may develop across Scotland and northern England with a risk of freezing rain in places. Please be prepared, take care, allow extra journey time and assist vulnerable neighbours if they need any help. Thank you. This entry was posted in Severe Weather Update on December 14, 2018 by Admin. Following the severe weather we experienced last year I have been working on a Community Emergency Plan to better prepare us for any similar emergency events. Villagers will recall how we were completely cut-off due to the roads being closed by snow and the situation could have become extremely difficult had the extreme weather continued, especially if we had also lost power. I was very proud of how the community came together, particularly the valiant villagers who kindly sourced some milk and bread. It is sensible to formalise arrangements should such a situation arise again. 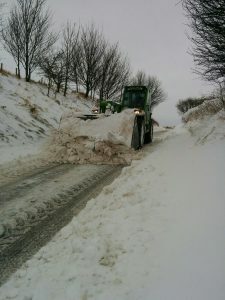 I have been consulting with the Council’s Emergency Planning & Risk Manager on what the Council can do to help, but we must also take steps to improve our own resilience – the severe weather in February highlighted how little the Council could actually do to help once we were cut off and not everyone was fully prepared. The main threats to our community include severe weather, such as snow, ice, flooding and high winds, which can cause falling trees and other hazards including first aid emergencies, fires and children/vulnerable people going missing. Do you have any skills, tools or other resources that could help in any of these situations? For example, local farmers or tree surgeons may have equipment or expertise they are willing to offer. People may be trained in first aid or happy to be called upon should a search party be required. Maybe you have a 4×4 vehicle and could offer transport to pick up supplies in snowy weather, when other vehicles cannot get out of the village. Would you be happy to be called upon in an emergency? If you would like to be added to our list of local skills and resources please respond using the form below. This entry was posted in Announcements, Severe Weather Update on October 24, 2018 by Admin. Thank you to the local tractor-wielding farming community for their tireless digging out of snowdrifts over the last couple of days. A council gritter was able to access Garvald yesterday for the first time in several days and provide access, with care, to Haddington. This entry was posted in Severe Weather Update on March 4, 2018 by Admin. Our understanding is that there is no milk or bread available in Haddington. Car high snow drifts are blocking the roads. Please stay home in the warm and do not attempt to travel. Hopefully the weather will start to improve over the next few days but please can anyone who needs any help, assistance or emergency supplies let us know via the garvald.org.uk Facebook page or here on the website via the contact form. Please let us know if anyone with heavy duty 4×4’s can help bring in supplies (if the roads are passable tomorrow). Also, we will try to arrange an emergency milk delivery from Yester Farm Dairy sometime on Friday or Saturday, subject to road conditions. More details on how to order some milk will be posted here and on Garvald’s Facebook page. We have a very caring community so I know we will all be checking up on any vulnerable neighbours but if anyone is concerned or needs assistance, please also let us know. The village hall is Garvald is open from 10am and the Morham Hall is open from 10.30 on Friday if you need to get out of the house for a while. This entry was posted in Severe Weather Update on March 1, 2018 by Admin.